A recent market study published by PMR – 'Dental Preventive Supplies Market: Global Industry Analysis 2013–2017 & Forecast 2018–2026', consists of a comprehensive assessment of the most important market dynamics. On conducting a thorough research on the historic as well as current growth parameters of the dental preventive supplies market, growth prospects of the market are obtained with maximum precision. The report features unique and salient factors that may have a huge impact on the development of the dental preventive supplies market during the forecast period. It can help market players modify their manufacturing and marketing strategies to envisage maximum growth in the dental preventive supplies market in the upcoming years. 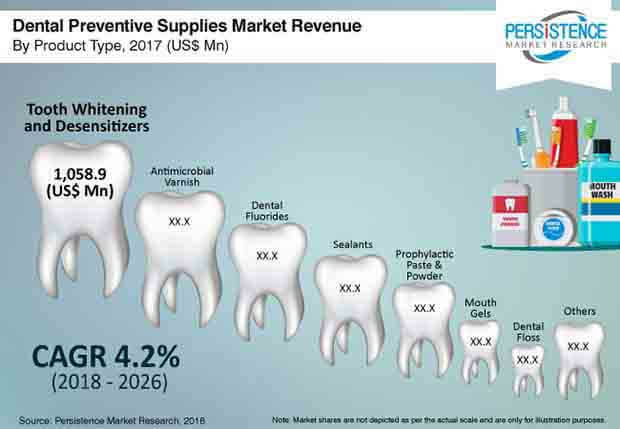 The report provides detailed information about the current and future growth prospects of the dental preventive supplies market in the most comprehensive way for the better understanding of readers. Focus on the prevention of oral diseases has become a priority through out the world. Advanced research and increased knowledge about the oral diseases are the major factors responsible for an increase in the growth of dental Preventive supplies market . There are various activities and programs related to oral hygiene which reduces the oral disease burden and in turn , increases the demand of oral preventive products driving the market of dental preventive supplies in the forecast period . Increase in the number of dental clinics in developed countries and the growth of dental clinics play a significant role in the growth of dental preventive supplies market. A significant increase in the prevalence of dental caries mainly due to unhealthy lifestyle, smoking, and excessive consumption of alcohol among the young populations increases the demand of dental products. There is also an increase in the adoption of various prevention products through increased awareness regarding the oral disease. These factors which will further increase the demand for dental preventive supplies market in the forecast period. Growth in risk factors such as fatty and junk food intake, tobacco use, trauma, and others are the prime driver of the dental preventive supplies market. According to world health organization 60–90% of young population and nearly 100% of adults have dental cavities. Severe periodontal (gum) disease, occurs in about 15–20% of adults. The number of people with missing teeth comprises about 30% of people aged 65–74. The world health organization also states that 16-40% of children in the age range 6 to12 years old are affected by dental trauma around the world . An expand in the dentistry profession is another driver of dental preventive supplies market. The growing awareness is also a major driver of dental preventive supplies market. According to CDC, in 2016 about 64.4% of adult population in visit annually and 84.6 % of children aged 2-17 years visit dentist in US. Increasing graying population is prone to different types dental disease which will surge the need of dental care further contributing to the demand for dental preventive supplies market. An increase in the demand for dental products among graying population creates enormous opportunities for the manufactures which can drive the dental preventive supplies market. Improved life expectancies of graying population can also be a driving factor of dental preventive supplies market. Increase in the prevalence of dental decay and increase in the populations will increase the usage of preventive care products which drive the market of dental preventive supplies in future. Wide use of fluoride gels and sealants especially in the younger population for the prevention of dental caries further increases the demand of preventive dental products such as fluoride gels, Antimicrobial varnish, sealants, mouth gel etc. which can drive the market of dental preventive supplies in the forecast period. The development of various new products and innovation in the already existing dental care products will further spur the market of dental preventive supplies market. Apart from these factors, an increase in the spending on dental care and growing disposal income further increased demand of dental preventive supplies in the developing countries which drive the market of dental preventive supplies market in the near future. The competition section of the Dental Preventive Supplies market features the profiles of the key players operating in the Dental Preventive Supplies industry based on their market shares, differential strategies, product offerings, marketing approach, and company dashboard. Some of the Dental Preventive Supplies market key players featured in this report include 3M Company, KaVo Kerr Corporation (Danaher), Dentsply Sirona, Ivoclar Vivadent AG, Preventive Technologies Inc., Dental Technologies Inc., Young Innovations Inc., GC Corporation, Cantel Medical (Crosstex International, Inc), TePe Oral Hygiene Products Ltd. The key manufacturers of dental preventive supplies offer a wide range of dental products and services for dental preventive measures. 3M is a diversified company of dental preventive supplies which has expertise in product development, manufacturing and marketing. The company operates in five business segments viz. Industrial; Safety and Graphics; Health Care; Electronics and Energy; and Consumer. Dentsply Sirona Inc. is the world’s largest manufacturer of professional dental products and technologies, with a strong 130-year history of service to the dental industry and patients worldwide. It provides dental professionals a comprehensive end-to-end solutions offering. Key manufacturers of Dental Preventive Supplies are focusing on their growth plan which is built on three pillars: sales force effectiveness, accelerating the pace of innovation and improving our performance in developing economies. Many companies of dental preventive supplies are focusing on geographical expansion to boost their Dental Preventive Supplies market share. Dental preventive is an oral care for actively caring for the teeth to keep them strong and healthy. Preventive dentistry aims to stop the progression of dental caries. Preventive dentistry basically focuses on the life practices and the procedures that help people to prevent the occurrence or growth of an oral disease. The company conducted a research study on the Dental Preventive Supplies market for the forecast period 2018 to 2028. The report offers a comprehensive evaluation of the business opportunities prevailing in the Dental Preventive Supplies market, along with insights on the consumption trend, disease incidences, and awareness level for dental preventive supplies, and also market competition. The report elaborates the macroeconomic factors influencing the dynamics of the Dental Preventive Supplies market, and its futuristic potential. The report offers a comprehensive taxonomy of the Dental Preventive Supplies market based on product type, distribution channel and region. Based on product type, dental preventive supplies are segmented into Dental Fluorides, sealants, mouth gel, Prophylactic paste & powder, Tooth Whitening and Desensitizers, Antimicrobial Varnish, Dental Floss and others. Based on the distribution channel, the Dental Preventive Supplies market is segmented into drug stores, retail pharmacies and E- commerce. What is the revenue potential of the products related to Dental Preventive Supplies across the regions of North America and Europe? Who are the key competitors, and what are their portfolios in the Dental Preventive Supplies market? What are major challenges influencing the growth of the Dental Preventive Supplies market? How intervention from insurance coverage is shaping the Dental Preventive Supplies market growth? The Dental Preventive Supplies market has been estimated based on the supply-demand approach. A triangulation methodology is adopted to derive the Dental Preventive Supplies market size, which is primarily based on overall expenditure on capital equipment installed base , life science research and R&D funding to obtain precise market estimations and insights on life science and biotechnology associated services , products, technologies and applications,. This information is further validated with rigorous primary research (including interviews, surveys, in-person interactions, and viewpoints of seasoned analysts) and secondary research (including verified paid sources, authentic trade journals, and resourceful databases) . Tepe oral hygiene products Ltd .
Preventive Technologies , Inc .
Young Innovations , Inc .